This article is about the Valkyrie sports car. For other uses, see Valkyrie (disambiguation). The sports car is a product of collaboration between Aston Martin and Red Bull Racing to develop a track-oriented car entirely usable and enjoyable as a road car. The car's makers claim the title of fastest street-legal car in the world for it. Adrian Newey, Red Bull Racing's Chief Technical Officer and the world's most successful F1 designer aided in the design of the car. Its main competitor is the Mercedes-AMG One. The original codename was Nebula, an acronym for Newey, Red Bull and Aston Martin. The name AM-RB 001 was chosen as the final codename, and was decided since Aston Martin and Red Bull Racing had collaborated all throughout the project. AM stands for Aston Martin, and RB stands for Red Bull. 001 may be a possible reference to it being the first production car the two have collaborated on. In March 2017, Aston Martin revealed that the car would be named Valkyrie, after the Norse mythological figure. According to Red Bull, the name was chosen to continue the tradition of "V" nomenclature of Aston Martin's automobiles and to distinguish the vehicle as a high-performance car (the "V" was used as the distinguishing factor). A show car was initially unveiled to the public in order to give the public an idea of its design. The design was nearly finished at the time in a near-production-ready form. The exterior of the car is extremely aerodynamic for a sports car, with an extensively open underfloor,that works on the principle of the venturi effect, that can fit an entire person, and is capable of producing 1,814 kg (4,000 lb) of downforce at high speed. Gaps from on top on the car (e.g. the front axle and the roof intake) and a large front splitter aid in generating downforce. The wheels are also designed to manage the airflow and be as light as possible at the same time. The interior design was leaked online on 20 June 2017 and gave a preview of the car's design. The interior has no gauge cluster, but rather a collection of screens. By the left and right corners are the screens for the camera side mirrors. One screen sits at the top of the center console, which may have a collection of live vehicle information, and regular vehicle controls, but this is not confirmed. A screen is used on the race-inspired steering wheel and acts as the driver gauge cluster. Dials and switches sit beside the wheel screen to allow for easier changes without driving interruption. The seats, formed from hollow carbon fibre straight into interior perimeter, are bucket variants, and have two seat belts for each car seat. Because of the extremely small interior and doors (which are practically roof-only hatches), each seat is designed specifically for the owner's body shape through 3D scanning. A removable steering wheel provides slightly more space for entry and exit. In February 2017, Aston Martin revealed most of the vehicle's specifications. The final specifications were revealed later in the year. Several manufacturers (other than Aston Martin and Red Bull) have taken part in the Valkyrie's construction, those being Cosworth, Ricardo, Rimac Automobili, Multimatic, Alcon, Bosch, Surface Transforms, Wipac, and Michelin. The car contains a 6.5-litre naturally-aspirated V12 engine tailored by Cosworth, which was initially planned to produce around 1,000 hp (746 kW; 1,014 PS), but it was later announced in June 2017 that the engine would have a power output of 1,146 PS (843 kW; 1,130 hp) at 10,500 rpm with a redline of 11,000 rpm. At the same time the power output figures of the engine were released, the weight was also mentioned, at 1,030 kg (2,271 lb), which surpasses the intended 1:1 power-to-weight ratio, with 1,112 PS (818 kW; 1,097 hp) per ton. The car can accelerate to 97km/h (60 mph) from a standstill in a time of 2.5 seconds. A Rimac-built hybrid battery system, which performs as a KERS system, is installed along with the engine. The power is delivered by a 7-speed paddle-shift transmission constructed by Ricardo. The exhausts come out nearby the engine, similar to the ones from F1 race cars and the Porsche 918 Spyder. Bosch supplies the Valkyrie's ECU unit, traction control system, and ESP. The braking system is provided by Alcon and Surface Transforms. The front and rear lights are manufactured by Wipac. The car has all-carbon fibre bodywork and is installed with a carbon fibre Monocell from manufacturer Multimatic. Michelin supplies the Valkyrie with the company's high-performance Sport Cup 2 tyres, having sizes of 265/35-ZR20 at the front and 325/30-ZR21 at the rear. The wheels are constructed out of lightweight magnesium alloy (20" front, 21" rear) with race-spec centre-lock wheel nuts to reduce mass. The track only variant of the Valkyrie called the Valkyrie AMR Pro was introduced at the 2017 Geneva Motor Show. Only 25 units will be produced, all of which have already been sold out. The AMR Pro uses the same 6.5-litre naturally-aspirated V12 engine as used in the Valkyrie road car along with the Rimac Energy Recovery System, although the KERS system will be reprogrammed in terms of its control systems. The engine will also be modified, which means the AMR Pro will have increased engine power output figures than its road legal counterpart. The AMR Pro uses smaller 18-inch wheels at the front and rear. This is to allow the Michelin racing tyres (based on LMP1 race cars) to actually fit the car, with F1-inspired carbon-carbon brakes to aid braking performance. The air-conditioning system and infotainment screens have been removed, and have been replaced with racing counterparts. The car will be able to generate 3.3 g lateral force during cornering and 3.5 g during braking. Top speed is intended to be higher than the road car, at 402 km/h (250 mph). The car's exhaust will have very minimal parts to silence the engine. The AMR Pro will have a significantly more aggressive design, with a LMP1-style rear aerodynamic fin, a large dual-element rear spoiler, and a large rear diffuser. The road car's production will be limited to 150 units at a unit price of US$3.2 million. Aston Martin CEO Andy Palmer enlisted a policy in a Twitter post on 4 July 2017, stating that if the owner were to "flip" the car (buy and sell quickly to make a profit), the owner would not be provided the opportunity to buy any further special edition models from Aston Martin. This policy is also used for Ford's new GT and Mercedes-AMG's One sports cars. In July 2016, the Valkyrie was unveiled as a non-working full-scale model in Aston Martin's headquarters in Gaydon. In November 2016, the car was featured in a private Aston Martin showcase at the Etihad Towers in Abu Dhabi, the day before the 2016 F1 Abu Dhabi Grand Prix. From December 2016 to February 2017, the car was featured in the 2017 Festival Automobile International in Paris. In February 2017, the car was featured as the star car in the 2017 Canadian International Auto Show in Toronto. In March 2017, the Valkyrie was featured at the Aston Martin stand along with the new Vanquish S Volante, the Rapide S AMR, and the V8 Vantage AMR-Pro at the 2017 Geneva Motor Show in Geneva, Switzerland. On 1 July 2017, Rockstar Games revealed a Valkyrie-inspired sports car for their game Grand Theft Auto V, called the Dewbauchee Vagner. ^ "Aston Martin and RedBull Racing collaborated HyperCar". Retrieved 24 August 2016. ^ "Aston Martin claimed to be the fastest Street-legal car". Retrieved 24 August 2016. ^ "Adrian Newey involved in the designing of AM-RB-001". Retrieved 24 August 2016. ^ "Adrian Newey world's most successful F1 designer". Retrieved 24 August 2016. ^ "Mercedes-AMG 'Project One' - Defining the future with 'a street-legal F1 powertrain'". Evo. Retrieved 2017-03-26. ^ "Audi Plotting Electric Hypercar To Rival Aston Martin Valkyrie". CarBuzz. Retrieved 2017-03-13. ^ "BMW Might Build A Hybrid Hypercar To Compete With Mercedes". Motor1.com. Retrieved 2017-04-22. ^ "Aston Martin names its hypercar 'Valkyrie'". Top gear. Retrieved 2017-03-06. ^ Schran, Oliver. "Codename AM-RB 001 becomes Aston Martin Valkyrie". Retrieved 2017-03-16. ^ "Aston Martin Valkyrie revealed in most production-ready form yet | Autocar". www.autocar.co.uk. Retrieved 2017-06-15. ^ "New Aston Martin Valkyrie Scares Off All Other Hypercars In Geneva". Carscoops. Retrieved 2017-03-11. ^ Perkins, Chris (2017-06-14). "Hey! The Aston Martin Valkyrie Has Headlights Now". Road And Track. Retrieved 2017-06-14. ^ "Aston Martin Has Updated The Valkyrie To Be Even More Unbelievable". jalopnik.com. Retrieved 2017-07-12. ^ "Aston Martin Valkyrie's high-tech cabin leaked". TheWeek UK. 2017-06-20. Retrieved 2017-06-20. ^ King, Alanis (2017-05-24). "The Aston Martin Valkyrie Won't Let You Get Fat". Jalopnik. Retrieved 2017-06-13. ^ "Aston Martin will 3D-scan drivers' bodies to make custom seats for the Valkyrie". Digital Trends. 2017-05-25. Retrieved 2017-06-15. ^ Saiidi, Uptin (2017-05-23). "Aston Martins upcoming car will 3-D scan your body for the driver seat". Retrieved 2017-06-15. ^ "Aston Martin AM-RB 001 will rock a Cosworth 6.5-litre V12 engine". Motor1.com. Retrieved 2017-02-15. ^ "Report: Aston Martin's Valkyrie will have 1,130 hp, weigh just over a ton". AutoWeek. 2017-06-23. Retrieved 2017-06-23. ^ "2018 Aston Martin Valkyrie". Top Speed. 2018-12-13. Retrieved 2019-01-05. ^ "Aston Martin Valkyrie - Engine View". Motor1.com. Retrieved 2017-03-09. ^ "Otherworldly Performance". Aston Martin. Retrieved 13 May 2018. ^ "Aston Martin Valkyrie: specs, price and full details". Evo. Retrieved 13 May 2018. ^ "Michelin chosen as official tyre supplier for Aston Martin Valkyrie hypercar". MichelinMedia.com. 2017-03-07. Retrieved 2017-03-08. ^ a b c "Aston Martin Valkyrie AMR Pro: Redefining the limits of performance". www.astonmartin.com. Retrieved 2017-12-30. ^ a b c "Aston Martin Valkyrie AMR Pro is the most insane Aston yet". Roadshow. Retrieved 2017-12-30. ^ a b "Behold: the 250mph Aston Martin Valkyrie AMR Pro". www.topgear.com. Retrieved 2017-12-30. ^ Lee, Kristen. "Flipping Your Aston Martin Valkyrie Will Make Aston Very Mad". Jalopnik. Retrieved 2017-07-12. ^ "Mercedes-AMG Won't Allow Project One Owners To Flip Their Cars". Retrieved 12 November 2018. ^ "Aston Martin and Red Bull Racing unveil radical AM-RB 001 hypercar in the Middle East". me.astonmartin.com. Retrieved 2017-02-16. ^ "Behold the beautiful Aston Martin AM-RB 001 hypercar in 41 photos". Motor1.com. Retrieved 2017-02-16. 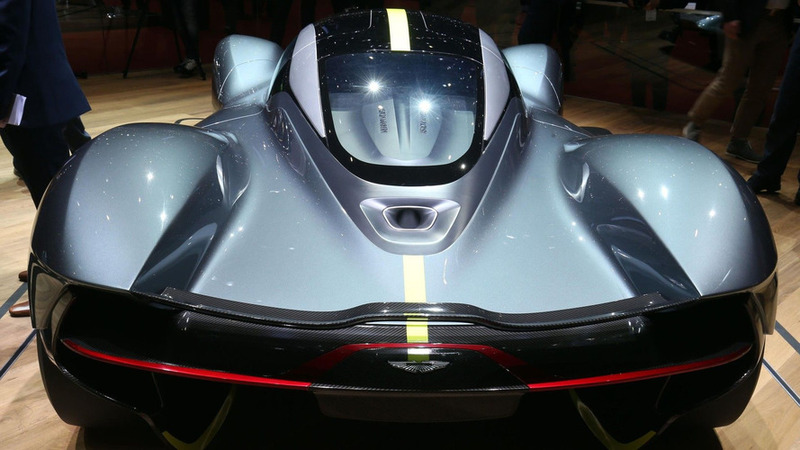 ^ "Aston Martin AM-RB 001 Makes Global Debut In Toronto... Sort Of". topspeed.com. Retrieved 2017-02-21. ^ "GTA Online's new supercar is really freaking fast". VG247.com. Retrieved 2017-07-14. Wikimedia Commons has media related to Aston Martin Valkyrie.